“Pirate Day” was a day for nothing but imaginative play. During the week we learn in class all about the history of the Age of Piracy - the causes and effects, the role of Caribbean geography in piracy, the scientific advances in navigation and ship-building, and the exciting stories of trickery and thievery. But all the knowledge and information we impart to our students in the classroom is much more effectively cemented by BECOMING a pirate! As with many Fun Fridays, we began the day by crafting and making. We made flags, hats, eye-patches, message-in-a-bottle necklaces, and parrot friends. Meanwhile, our middle-school students joined in the fun by preparing food and drinks for our hungry pirates and by turning washer and dryer boxes into pirate ships. 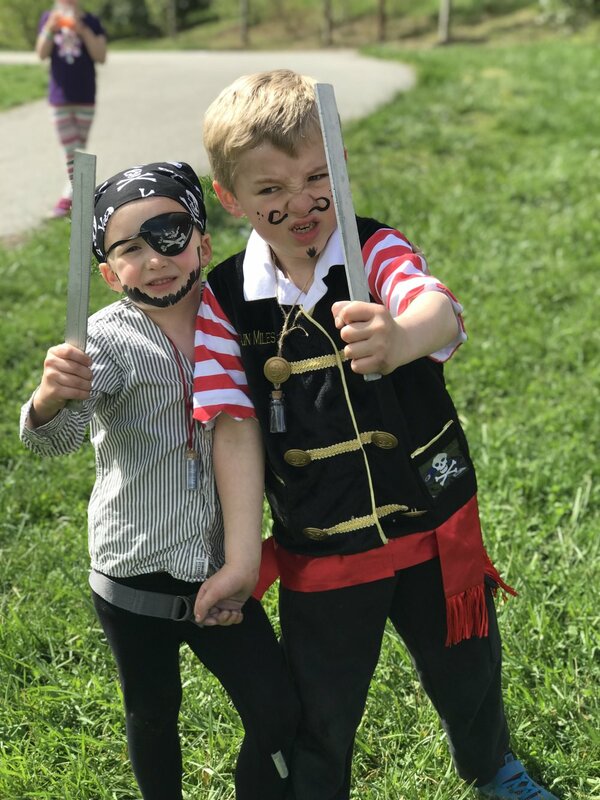 Soon it was time for our pirates to join up with a crew and follow a map to find treasure on the playground (aka, the high seas). With their treasure in hand, the pirates had money for the finer things in life, like snacks and drinks, and time to pursue some of their favorite pursuits, like practicing their sword and pistol skills. There were also opportunities to make more cash by working on nets for the ship. And at any time, they could venture back out to sea on their cardboard “ships” to explore and battle other pirates. Finally, we ended the day with a team game, Pirate Fort battles.